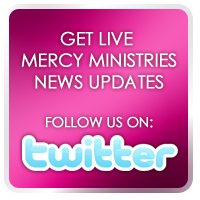 Mercy Ministries News: Mercy Graduate Gets Her Miracle! Mercy Graduate Gets Her Miracle! Ashley came to Mercy Ministries in 2006 battling for her life. She struggled with a severe eating disorder and was desperate for freedom from this life-controlling issue. After so many years of damage to her body, one of Ashley’s concerns was that she might never be able to have the children she and her husband Josh dreamed of. While at Mercy, Ashley found her healing and value in Christ, and since graduating in 2006, she has gotten very involved with her church, shared her powerful testimony with others and is walking in complete freedom! She recently shared some other exciting news that we wanted to pass along to you. Hello Nancy! I thought I would send you an e-mail and share some great news. Josh and I just found out this week that we are expecting! We have been trying to conceive since we got married, which was almost seven years ago! This story is truly a testimony to God! Not only am I excited about this child we are about to bring into this world, but God has got me all kinds of excited about HIM! He is so full of surprises. I have learned that God's timing is perfect, and He is the only One who can make such a miracle happen. I could go on and on! I'm just so excited about what God is doing in our lives and praying that the girls at Mercy can truly come to know their awesome Father. Please take care and know that I am praying for you. Ashley came for a visit in April and spoke to the Nashville residents about her experience at Mercy and life after graduation. We are excited to tell you that at 11:39 PM on July 4th, Joshua Jr. was born weighing 6 lbs. 13 oz. and everyone is healthy and doing great! Congratulations to Josh and Ashley as you begin your journey as parents to this beautiful baby boy. If you would like to know more about how you can help bring hope, healing and a future to young women like Ashley, go to www.mercyministries.com and click on “How to Help.” When you support Mercy Ministries, you are not just investing in these young women while they go through the program, you are investing in future leaders, wives and mothers and impacting generations to come! Mercy Ministries Graduates Change the World!! A Day on the Lake with In His Wakes Ministries!!! Three More Lives Transformed in St. Louis!